AND CALLED THE NEW TOWN. THE COLLEGE ORDERED TO BE HERE, 1637. You find this sign at Harvard Square on the corner of Massachusetts Avenue and Dunster street. It marks the first settlement of what was meant to be the capital of the new colony. The leader of Massachusetts Bay Colony, Thomas Dudley was born into a powerful and noble family in 1576. The Sutton family were the barons of Dudley, and one of its first members was John Sutton III (1339-1370) married to Catherine de Stafford (1340-1361). Thomas Dudley got his name from Dudley Castle that was built just after the Norman conquest in 1066, and taken over by one of his ancestors, John de Sutton in 1321. Thomas Dudley became a puritan as a young boy, and traveled to the Americas in 1629 where he served as a deputy governor and governor of the Bay state. In fact it was here, just on Harvard Square, that the New Towne was located. Thomas Dudley has many descendants in the United States. Among them are senator John Kerry, president Herbert Hoover, socialite Edie Sedgwick, actor Humphrey Bogart, playwright Tennessee Williams, and the actors Christopher Reeve and Bill Cosby. What about the name of Dunster street? Well Henry Dunster (1609-1659) took over as leader of Harvard College after Nathaniel Eaton 1639. 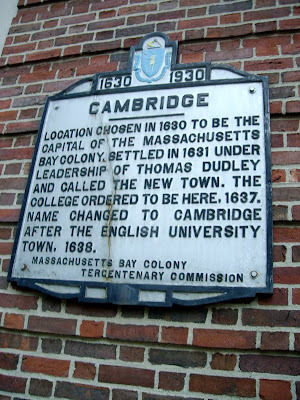 He, John Harvard, and Nathaniel Eaton were educated at Cambridge University, so it is not strange that they chose the new name of New Towne in 1637. 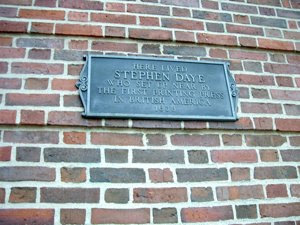 Stephen Daye was born in London 1594, and moved with his wife Rebecca, his children and servants to Massachusetts. He set up a printing press in reverend John Glovers house in 1638, thus being the first printer in the new world. 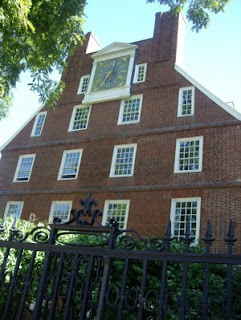 This sign is found on one of the gates to Harvard Yard from Massachusetts Avenue. It marks the spot of two houses that once were found here. One belonged to the first school master at Harvard Nathaniel Eaton, the second belonged to one Edward Goffe. We know much about the first, and less of the second. 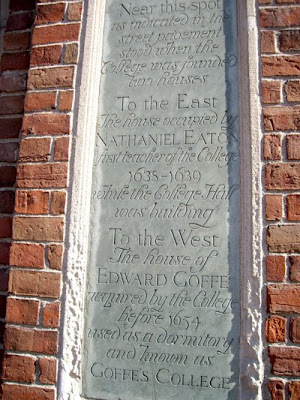 Eaton was born 1610 in London, and was educated at Westminster School, a prestigious independent school founded in the 12th century located by Westminster Abbey. He met his good friend John Harvard at Trinity College in Cambridge, before leaving to study at University of Leiden. He left for the new world between 1634 and 1637, and became the first school master. During these years there were serious tensions between the puritan community, lead by John Winthrop and many of the colonists. This effected Nathaniel Eaton severely. He was dismissed from his job 1639, as he was accused of having punished one of the pupils too harshly, and his wife was supposed to have served Hasty Pudding with goats dung in it (!). He fled to Virginia and sent for his wife and children, but they disappeared on the boat that were to bring them south. 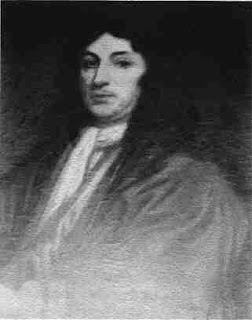 Eaton remarried, and returned to England and ended in 1669 up as rector in Bideford in Devon. He died four years later. 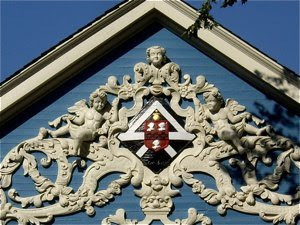 The other house belonged to one Edward Goffe and was acquired by Harvard College in 1654. It was later used as a dormitory and kept the name of its former owner. He was born 1594, in Ipswich, England. Edward Goffe was a resident of Cambridge and owned land here and in nearby Watertown. He married his first wife, Joyce Cutter in England 1624. She died in 1638 having given birth to two sons and one daughter. He married his second wife, Margaret Wilkinson in 1638 / 1639. They had two sons and two daughters.